Based on a study conducted by the São Paulo Research Foundation, five fruit trees indigenous to the Atlantic Rainforest have potent anti-inflammatory and anti-oxidant qualities. These species are endangered and extremely rare; therefore, two local farms that strive for plant conservation, and reside in the interior of São Paulo State, provided the study samples. One of the farmers owns Brazil’s most significant indigenous fruit collection, which cultivates over 1,300 species, and according to Rosalen, Brazil has roughly 400 Eugenias including many endemic species. “We have an enormous number of native fruit trees with bioactive compounds that could benefit people’s health. They should be studied,” he states. These fruits have pharmacological and economic potential as evidenced by their essentials oils, edible fruits, wood, and their uses as decorative plants and will soon be considered the next superfoods, according to Alencar. “There wasn’t much scientific knowledge about the properties of these native fruits. The idea now, with the results of our study, is for them to be grown by family farmers, increase production scale and be taken up by retailers. Who knows, they could be the next açaí,” said Alencar, referencing to the success of the Amazonian berry, Euterpe oleracea. Euterpe Oleracea or açaí also contains significant amounts of anti-oxidants and is exported from Brazil to many other countries as a puree. “Even before the project with UFRO, Rosalen and I already studied native fruit species because we believed they could be a source of excellent food solutions for society,” Alencar stated. Adapted from: Fundação de Amparo à Pesquisa do Estado de São Paulo. “Little-known fruits contain powerful anti-inflammatory and anti-oxidant agents.” ScienceDaily. ScienceDaily, 31 October 2017. www.sciencedaily.com/releases/2017/10/171031143708.htm. And….just one more nutritional tip! Back to class means after-school snacks! Plan healthy snacks along with your weekly meals. Add them to your shopping list to prep for the week ahead. What are nightshade fruits and veggies? Nightshade fruits and vegetables are a broad group of plants from the Solanum and capsicum families. Nightshade plants contain poisons, one called solanine. While ingesting nightshade plants can be fatal, fruits and vegetables in this same classification of plant, many of which you’ll find at your local grocery store, are actually safe to eat. This is because the amount of this toxic compound is lowered to nontoxic levels once the fruits and vegetables ripen. Still, the leaves and berries of the deadly nightshade plant are poisonous and shouldn’t be consumed. So, which nightshades are the most nutritious? Tomatoes are a staple of many diets for numerous reasons. In addition to how easy they are to grow, they’re also packed with nutrition. This fruit is high in vitamins A and C and is also a good source of iron, potassium, vitamin B-6, manganese, and dietary fiber. According to Penn State University’s Extension program, current research suggests that tomatoes contain carotenoids, powerful antioxidants that protect the body from certain types of cancers. Lycopene, the most common carotenoid found in tomatoes, may help reduce the risk for pancreatic, prostate, and digestive cancers. Potatoes are one of the most abundantly grown foods used in the Western world. They’re also part of the perennial nightshade family that can be mildly poisonous when eaten before they’re ripe, while the skin is still green. Potatoes are excellent sources of vitamin C, which helps aid immunity. They also contain enough potassium, vitamin B-6, and fiber to make a healthier staple than you may realize. Moreover, they provide carotenoids, flavonoids, and caffeic acid, all forms of phytonutrients known to promote health benefits, according to the USDA. There are also many different types of varieties, which have various health benefits. Potatoes are rich in vitamins A, B, C, and E, along with iron and zinc. They provide an easy way to get necessary, critical amounts of nutrients for people living in developing worlds. Potatoes aren’t as healthy when they’re prepared with high amounts of fats, salts, and oils, like french fries. If you need a boost of vitamin C, bell peppers are an excellent choice. One green pepper contains more vitamin C than an orange (who knew?). Bell peppers are one of the tastiest snacks in the nightshade family. You can slice them up and dip them in hummus, add them to a stir-fry, or ????? (You fill in the question marks). Hot peppers may be nightshades, but like the sun they can bring some heat, and if your tongue can endure the burn, these fiery devils contain proper nutrients. Common hot peppers, such as jalapenos, serrano peppers, and red or green chilies, are excellent sources of vitamins C and A as well as potassium. Capsaicin, what helps give spicy peppers their kick, has been shown to decrease inflammation, which can help people with joint disorders walk with less pain. Eggplant is an excellent source of manganese, a mineral essential for both development and metabolism. Additionally, according to researchers, eggplant contains natural antioxidants that can help protect your skin from the oxidative stress of the sun’s ultraviolet radiation. Because of their meaty texture when cooked, they’re famous for vegetarians, think eggplant parmesan, as well as with vegans. The tomatillo is a nightshade that grows in a husk and is similar to a tomato. Common in Central and South America, it’s a staple of Mexican green sauces and can be boiled, fried, or steamed. While not as nutritiously plentiful as your garden-variety red tomato, they contain antioxidants and can help you sneak some extra fiber into your diet without adding in too many extra calories. To find fresh goji berries, you’ll have to visit a Chinese plantation. However, they’re also typically found at specialty food stores in dried form, sometimes labeled as wolfberries. Goji berries contain protein and many healthy amino acids such as tyramine. They’re high in antioxidants, which help immune function and cell health. If you’re trying them for the first time, know that it’s possible to be allergic to them. You’ll want to stop eating them should you develop a rash or become ill.
Blueberries contain solanine alkaloid like nightshade plants, though they aren’t technically a nightshade plant. Blueberries are often touted as a superfood because many believe they contain cancer-preventing ingredients. They’re high in antioxidants, which are known to reduce inflammation. With that in mind, blueberries are thought to prevent inflammatory diseases such as metabolic syndrome, type 2 diabetes, Alzheimer’s, and cardiovascular disease. According to researchers at the Gerontological Society of America, evidence from recent studies show that blueberries contain flavonoids, specifically one called anthocyanin, that’s directly associated with cognitive benefits. A cup of blueberries provides a quarter of your daily vitamin C needs, as well as supplying some dietary fiber. The fiber, when combined with probiotics in yogurt, can keep your gastrointestinal tract in good working order. Drink Plenty Of Water! Yes, you’ve heard that several times but are you taking the advice? Not only will water keep you hydrated but it will help you boost your metabolism. Drinking plenty of water improves your liver and kidney function, too! 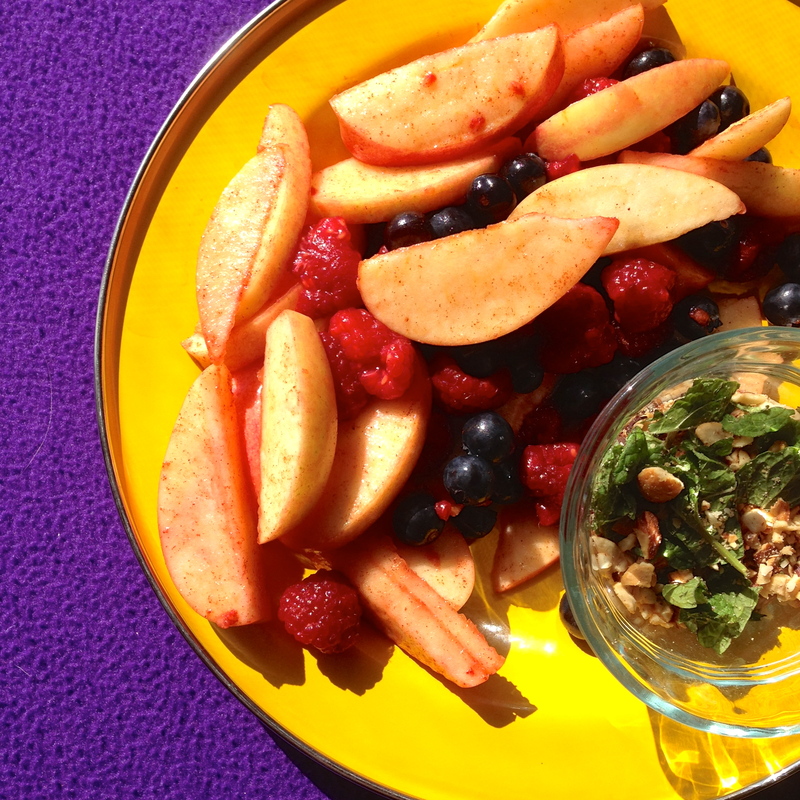 Mixed nuts and a hint of mint add another dimension to fruit salad. 1. Toss apples (or plums), raspberries, and blueberries with sugar, orange juice, and cinnamon; let stand 15 minutes. Serve sprinkled with nuts (or pistachios) and mint.